We are a leading Manufacturer of ss 304 pipe seamless, ss 310 pipe seamless, ss 304 rectangular pipe, ss 316 pipe seamless, ss 304l rectangular pipe and ss 316 rectangular pipe from Vadodara, India. We have marked a distinct and dynamic position in the market by trading and supplying a high quality array of SS Pipe Seamless. This pipe seamless is highly utilized in the gas and oil industry. 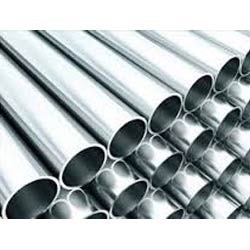 Offered pipe seamless is manufactured using high quality stainless steel at our vendors’ end. Provided pipe seamless is obtainable in a wide assortment of shapes, grades, lengths and other allied specifications. In order to cement our position, we are successfully presenting a wide and quality assured gamut of SS Rectangular Pipe. This rectangular pipe is demanded for diverse structural applications. Offered rectangular pipe is manufactured by our reliable vendors using premium grade stainless steel. This rectangular pipe is accessible in a wide gamut of grades, shapes and lengths and recognized for its rust resistance nature.